The 2019 FIA Formula One World Championship is an ongoing motor racing championship for Formula One cars which marks the 70th running of the Formula One World Championship. It is recognised by the governing body of international motorsport, the Fédération Internationale de l'Automobile (FIA), as the highest class of competition for open-wheel racing cars. Starting in March and ending in December, the championship is being contested over 21 Grands Prix. Drivers are competing for the title of World Drivers' Champion, and teams for the World Constructors' Champion. The 2019 championship also saw the running of the 1000th World Championship race, held in China. The season started with the Australian Grand Prix which was won by Valtteri Bottas from second on the grid in dominant style finishing 20 seconds ahead of Mercedes team mate Lewis Hamilton who himself only narrowly beat Red Bull's Max Verstappen to second. Verstappen's third place marked the first podium for a Honda powered car in over 10 years which was last achieved at the 2008 British Grand Prix. The second race of the season was the Bahrain Grand Prix. Ferrari topped every practice session and then went on go to lock out the front row in qualifying. Charles Leclerc earned the first pole position of his career by setting a lap time 3 tenths of a second quicker than his team mate Sebastian Vettel. In the race Leclerc fell down to 3rd in the 1st corner behind Vettel and the championship leader Valtteri Bottas. However he then climbed back up the order to take the lead despite being told by his team, Ferrari, to not overtake his team mate. Late in the race Leclerc was leading by around 10 seconds before his engine developed an issue allowing for Lewis Hamilton to take the race lead, a few laps later Valtteri Bottas also overtook Leclerc pushing him down to 3rd and making it a Mercedes 1-2. Just as it was looking like Max Verstappen was going to overtake Leclerc a safety car was called out due to both of the Renault cars of Nico Hülkenberg and Daniel Ricciardo having engine and power issues at turns one and three. The race finished behind the safety car for the eighth time in F1 history. This meant Lewis Hamilton won, Valtteri Bottas came second, and Charles Leclerc came home third for his first podium and Ferrari's first podium of the season. This meant that Valtteri Bottas lead the drivers championship by 1 point over team mate Lewis Hamilton entering Round 3 in China. 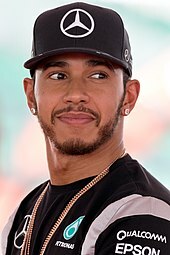 In China Hamilton led away at the start and won the Grand Prix resulting in him taking the championship lead by 6 points over his teammate Bottas whilst Mercedes extended their lead over Ferrari, becoming the first team since Williams in 1992 to start a season with 3 consecutive 1-2 finishes. Pierre Gasly set the fastest lap and finshed in sixth, after pitting with 3 laps remaining as Ferrari got their second podium of the season with Vettel.